Natural gas often contains mercury at concentrations that vary from below 1 to above 10000 µg/m³. Mercury is both toxic and potentially damaging: it can corrode or embrittle common gas plant components. Gas plants reduce mercury in natural gas with mercury removal units (MRUs). MRUs use fixed bed absorbers, often with sulfur-impregnated carbon or other chemisorbents as the active material. The Mercury Monitoring System is an ideal tool to determine the efficiency of each MRU in real time, and necessary to successfully monitor and control mercury concentrations during natural gas production and processing. 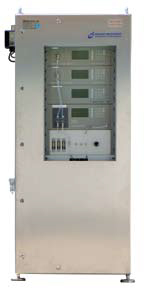 The Tracker-3000 IP uses a high-frequency driven electrodeless low pressure mercury lamp as UV source. This lamp emits lines of an extremely narrow bandwidth which are congruent with the absorption lines of the Hg atoms. Cross-sensitivities are thus minimized. The extremely high stability of the UV source is a result of the reference beam feedback control method. Total background noise is less than 0.1 µg/m³. The instrument is calibrated before delivery and keeps the calibration for a long period of time. For quality control a test screen is included allowing the user to check calibration. in Air and other Gases at Ultra Trace Levels.